So tomorrow is Valentines day, a day a bit like marmite - some people love it some people hate it. For me its always been a chance to celebrate the people I love. When I was younger and single I would organise a single ladies night where all my girlfriends would come together and have a fun evening and now I am married its more about having some quality time with my husband. This year we can't really afford a dinner out and fancy presents but for us it really isn't about that, instead we prefer something simpler with a home cooked meal, yummy cake and a romantic movie snuggled up on the sofa. I'm really looking forward to spending a bit of time appreciating the man in my life and I can't resist a good love film or book. For me romance novels are the best full of hope, adventure and of course love, they also happen to be the genre I prefer to write in and my own romance novel is hopefully going to get finished this year. 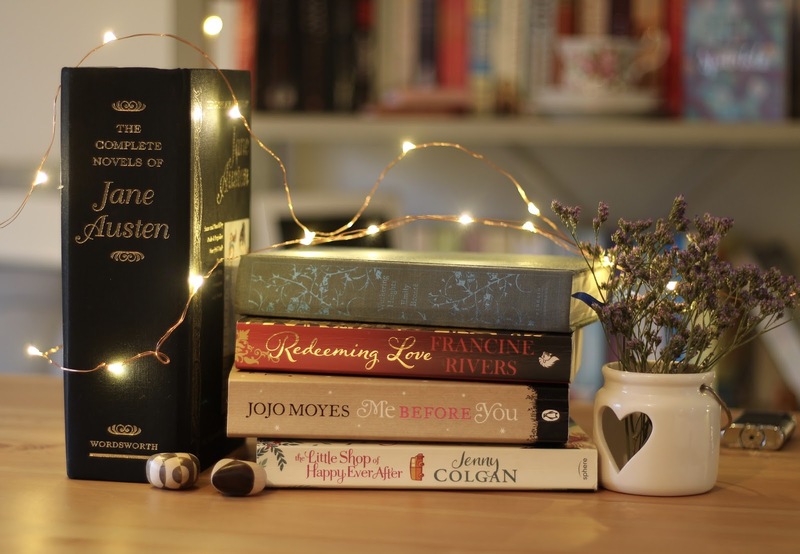 I decided for Valentines I'd put together a list of a few of my favourite romance novels for any of you, who like me, like to snuggle down with a good love story. This is a true classic and if you are looking for a meatier romance novel this is the one to go for. A gothic romance, Wuthering Heights is the beautiful story of the brooding Heathcliff and Cathy set in the Yorkshire moors this is a great story to read at this time of year snuggled up on the sofa. I've already written a book review about this book last year and it has definitely stayed a firm favourite of mine. This has to be one of the best love stories I have ever read, raw and heart wrenching this isn't a story for the faint hearted but so worth a read. If you are looking for a life changing book this valentines this is the one to go for! Recently turned into a blockbuster movie this is a beautiful book follows a rather unconventional love story of a man with quadriplegia and his personal assistant hired to "cheer him up". This book is a real tear jerker but one that will have you questioning what life is all about and have you raring to live life to the full. Jenny Colgan! The queen of romantic novels, I don't think I have ever read anything by her that I didn't love. She is definitely one of my favourite authors and there isn't a book of hers I've read that I haven't loved, it was hard to narrow down my favourite but so far I think it is this one. I loved this one I think especially as it was set in Scotland and about a book lover. The setting in this is so beautiful and the love story is one of the most romantic I've read. This is cheating slightly but I really couldn't choose which book by Austen I loved most and they are all the most beautiful love stories. There really is nothing like a good Jane Austen at any time of the year but especially on Valentines day reading about the tension between Lizzie and Darcy is the best.